The Global Volcanism Program has no activity reports for Hudson Mountains. The Global Volcanism Program has no Weekly Reports available for Hudson Mountains. The Global Volcanism Program has no Bulletin Reports available for Hudson Mountains. 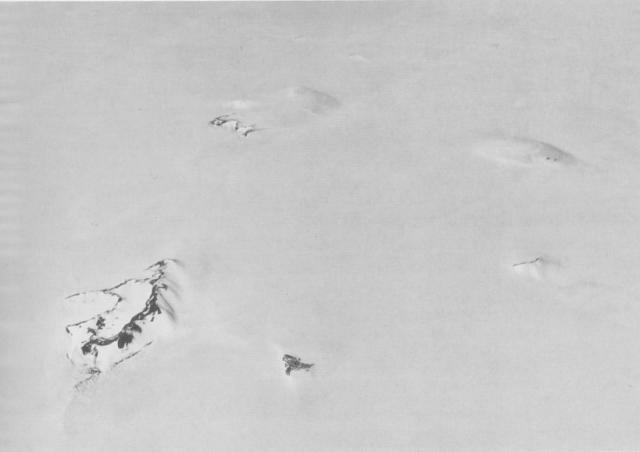 The Hudson Mountains, located along the Walgreen Coast in Antarctica's western Ellsworth Land, contain many only slightly eroded parasitic cones forming nunataks protruding above the Antarctic icecap. The cinder cones apparently rest on three extensively eroded Miocene stratovolcanoes, Teeters Nunatak, Mount Moses, and Mount Manthe. Subaerial basaltic lava flows dominate, but subglacial or subaqueous tuffs and lava flows are also present. A tephra layer from an eruption of a subglacial volcano in the Hudson Mountains was dated from ice thickness at about 200 BCE. The possible presence of steam was reported at one of the Hudson volcanoes during 1974. Satellite data suggested that an eruption of Webber Nunatak took place during 1985, although this has not been confirmed (LeMasurier and Thomson, 1990). Corr H F J, Vaughan D G, 2008. A recent volcanic eruption beneath the West Antarctica ice sheet. Nature Geosci, 1: 122-125. Craddock C, Bastien T W, Rutford R H, 1964. Geology of the Jones Mountains area. In: Adie R J (ed) Antarctic Geol, Proc 1st Internatl Symp Antarctic Geol, Amsterdam: Elsevier, p 172-187. Dort W, 1972. Late Cenozoic volcanism in Antarctica. In: Adie R J (ed) Antarctic Geol and Geophys, IUGS Ser-B(1): 645-652. LeMasurier W E, 1972. Volcanic record of Cenozoic glacial history Marie Byrd Land. In: Adie R J (ed) Antarctic Geol and Geophys, IUGS Ser-B(1): 251-260. There is no Deformation History data available for Hudson Mountains. There is no Emissions History data available for Hudson Mountains. Nunataks in the southern Hudson Mountains rise above the ice surface in this oblique aerial view from the west. Webber Nunatak is the left foreground, with Mount Manthe left of center (also with exposed outcrops), and Shepherd Dome the larger and uppermost of the two nunataks at the right. Several other smaller nunataks are visible in the foreground and faintly seen in the background. U. S. Navy photo TMA 2035 F31 203. The Global Volcanism Program has no maps available for Hudson Mountains. There are no samples for Hudson Mountains in the Smithsonian's NMNH Department of Mineral Sciences Rock and Ore collection. Large Eruptions of Hudson Mountains Information about large Quaternary eruptions (VEI >= 4) is cataloged in the Large Magnitude Explosive Volcanic Eruptions (LaMEVE) database of the Volcano Global Risk Identification and Analysis Project (VOGRIPA).